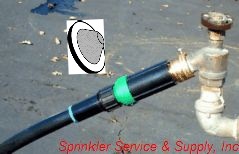 To start your drip system you will need a valve, filter and pressure regulator. The amount of filtration and pressure regulation will vary depending on your type of system. Simple Set Up: 1.Hose bib vacuum breaker to allow air into the tubing. 2. 25 psi regulator. 3. Cone Filter in hose swivel to catch debris. 4. Hose swivel with 1/2" drip tubing attached. A more permanent system would include an anti-siphon valve, wye filter, pressure regulator and then an appropriate fitting to transition either to PVC or drip tubing. 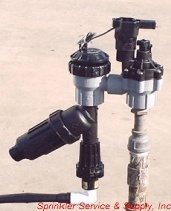 Rain Bird's combination filter and pressure regulator (PRF-075-RBY). Great for initial set up or retro-fit application. 3/4" MPT in x out, 20 psi regulation, with a maximum flow of 4.5 gallons per minute. Rain Bird's 1800Retro fits in place of a 4" pop up spray head. It combines a filter and pressure regulator to retro-fit into a conventional spray system for conversion to drip or micro-spray system. There are a variety of pressure regulators that regulate the pressure within various flow ranges. 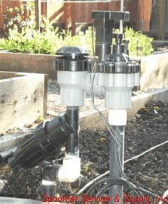 For large systems combining drip and micro-spray on one valve, select a regulator that will allow higher flows. The Hendrickson Brothers PR5830 Extra Duty regulates the pressure to 30 psi between flows of 1/2 gpm up to 12 gpm. Our standard wye filter is 150 mesh screen with 3/4" NPT inlet and outlet.